Drawn by the abundance of gas fields in the area, Fostoria opened for business in Fostoria, Ohio on December 15, 1887. As new fields of gas and coal opened, their move to Moundsville, WV in 1891 was a successful one, as well. Lancaster Colony purchased the operation in 1983, and continued operation until 1986, when the factory closed. 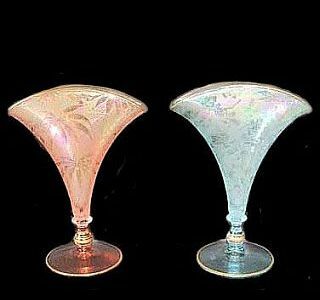 Many collectors of iridized glass do not include Fostoria examples in their accumulation. With a distinct feeling that while it may be in a class of its own, it is iridized and of top quality. 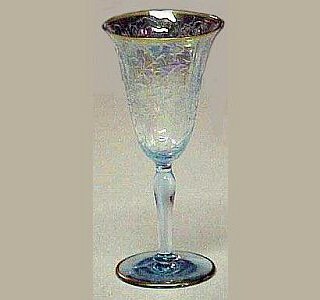 Therefore, we provide photos of the many and varied shapes as the glass presents itself for our advantage of doing so. 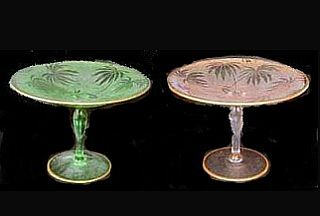 Fostoria and its “companion in kind”……..Central Glass, produced some of the finest quality glassware made in the Ohio Valley. We could not understand the near-complete lack of iridized examples shown in the Museum when we visited. 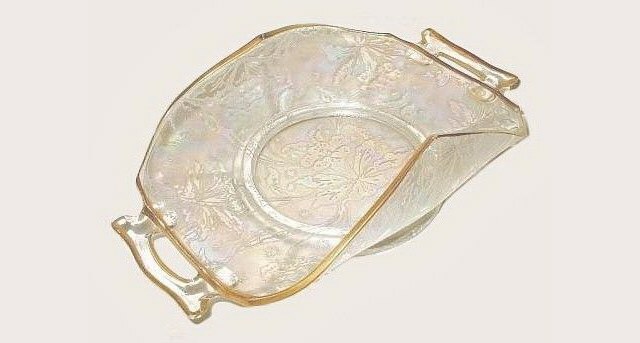 Granted, the American pattern by Fostoria made memorable history and came onto the scene during the period of America's ability to purchase some of the nicer things in life following WWII and on into the 1950s, but certainly it should not be given anymore status than their fine colored glass----in our opinion. 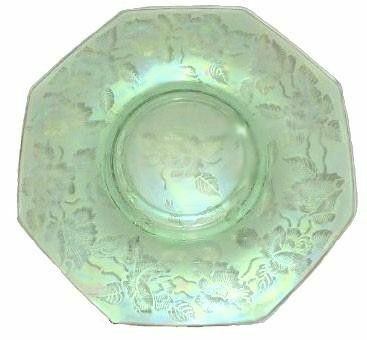 BROCADED PALMS Console Bowl.-15 in. handle to handle.-Lavender. 3.5 in. deep, 7.25 diam.and 13.25 in. overall width. 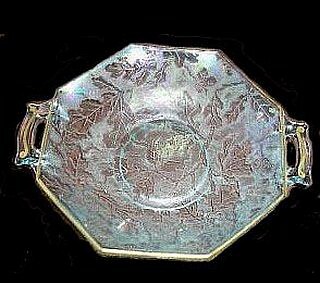 BROCADED PALMS Handled Bowl - 8.75 in. diameter. BROCADED PALMS Vases - 8 in.tall. 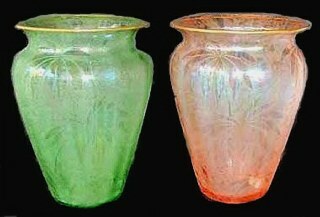 BROCADED PALMS Compotes in ice green and pink - 4 1/2 in. x 6 3/8 in. 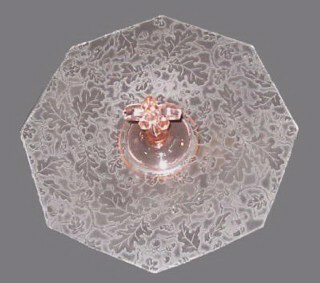 Fan Vase and 8 3/4 in. Ice Blue BROCADED ACORNS vase. 5.5 in. tall x 2.5 in. top opening. 6.75 in. plate - Blue. BROCADED ACORNS Server in Lavender. BROCADED DAFFODILS - white - 5 in. wide. BROCADED ROSES - 11 in. plate. And be rejected by the elders and chief priests and scribes, and be killed, and after three days rise again. He spoke this word openly. Then Peter took Him aside and began to rebuke Him. “Whoever desires to come after Me, let him deny himself, and take up his cross, and follow Me. For whoever desires to save his life will lose it, but whoever loses his life for My sake and the gospel's will save it.